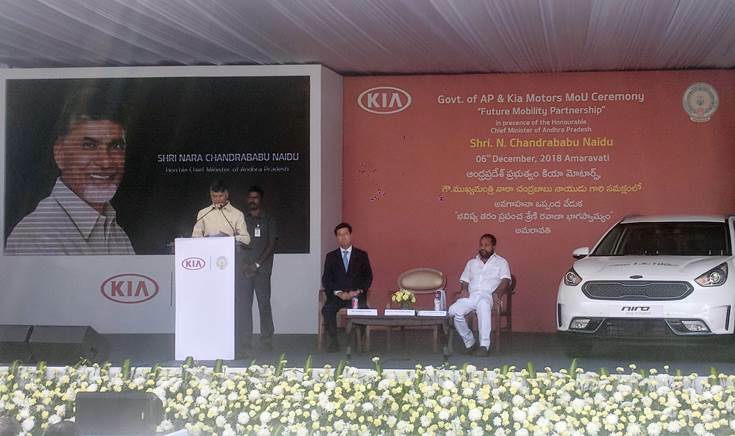 Kia Motors India, which is setting up its new 300,000 units per annum plant in the Anantapur district of Andhra Pradesh, today signed an MoU with the State government, aiming to support Andhra Pradesh’s vision of offering clean and sustainable mobility. As part of the MoU, the company has set up an EV charging station inside the premises of the Secretariat at Vijayawada, and has also donated three electrified vehicles to the state to run as pilot. 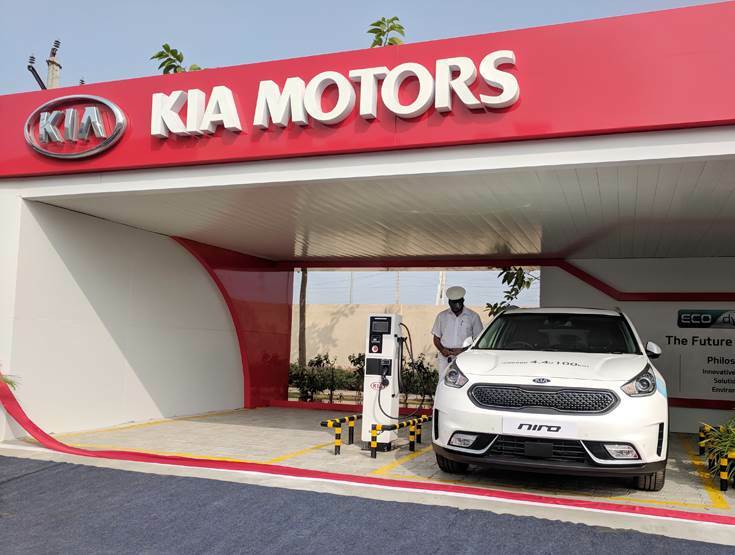 While the charging station is equipped with two regular chargers, the Korean carmaker has donated three electrified vehicles – the Kia Niro in its petrol-hybrid, plug-in hybrid and full electric form – to the state. The Kia Niro EV has a driving range of over 450km on a single charge, and can be charged to 80 percent of its capacity by a DC fast charger in one hour. The Niro hybrid, on the other hand, comes equipped with a 1.6-litre turbocharged petrol motor, mated to a dual clutch automatic transmission. Andhra Pradesh, which has a goal of setting up 14 smart cities in the state, will see the partnership reinforce its vision and give a fillip to EV sales in the state. “It's a remarkable day for us today as we embarks on the road to future mobility in India. We are providing the government with three of our world-class electrified cars, and Andhra Pradesh is taking progressive steps by giving incentives to both automakers and customers, and also installing charging stations in the state and building a green ecosystem,” said Kookyum Shim, managing director and CEO, Kia Motors India. “We will provide a range of futuristic technologies under our ACE (Autonomous, Connected and Electric) strategy and we will work with the Andhra Pradesh government to improve the quality of life of its citizens,” Shim added. N Chandrababu Naidu: "We are looking at radically transforming the mobility scenario in the state of Andhra Pradesh. We want to totally convert all vehicles in the state to full electrics." Kia Motors, which is looking at sustainable mobility in a big way, aims to have 16 electrified models globally by 2025, including hybrids, plug-in hybrids, battery electrics and a fuel-cell vehicle as well. The company says that it will remain agnostic to technology and will wait and watch for the government policy panning out in India before deciding upon its electrified model strategy in the country.